Remove the crusts, mushrooms, and fine scratches on the body of your vehicle. Restore the original color of your vehicle paint, so the color will come back as good as new paint and restore the metallic color of the vehicle. Coat the paint color of your vehicle, thus slowing the growth of the crust and mushrooms, as well as making the vehicle looks shiny and glossy wet look. To polish the body of your vehicle, it looks shiny and glossy wet look. MACSAUTO usually use this product for car waxing and body gloss as a finishing touch. Cleaner and conditioner for Genuine Leather and Synthetic Leather. Which is usually apply to clean up interior car leather, doortrim, and other leather accessories. 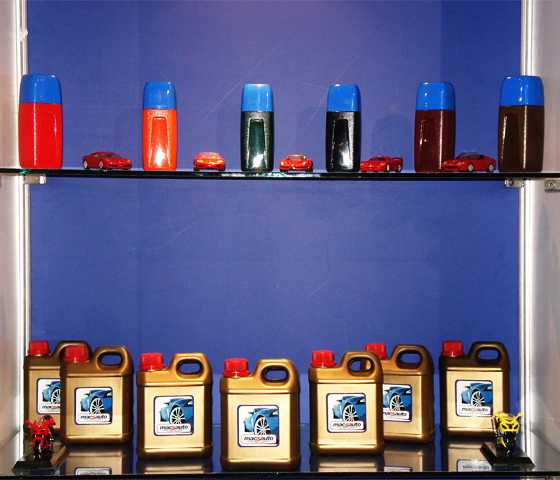 Special cleaning fluid to all parts of the car interior (plastic, carpet, materials made of rubber, dashboard, etc). Remove scale, acid rain, and fungi that attach to the window and windshield. Able to clean the crust and mushroom, even the most difficult to clean. One of the strengths in MACSAUTO is that we have ‘Creamy Shampoo’ which is really economical in use. 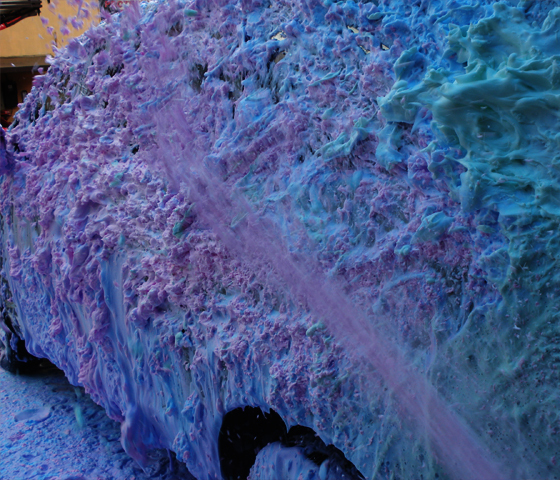 Its popular name is ‘Rainbow Snow Wash’. Creamy Shampoo has 8 different colors: Pink, Orange, Yellow, Green, Blue, Purple, Coffee Blended in mocca fragrant, and Snow White with fruit and flower fragrances. Creamy Shampoo 150mg mixed with 20 liters of water, it becomes 20 liters of shampoo will be ready to use. The amazing thing about Creamy Shampoo is packaged in five-kilogram, in the form of Pasta Shampoo. Which is so economical in delivery expenses and has been used in all MACSAUTO outlets throughout Indonesia. Sensomatic Car Wash machine is a new innovation in automatic washing machine industry. Sensormatic Car Wash Machine does not use brushes on the operation. Hence, it does not damage the paint and body of cars. 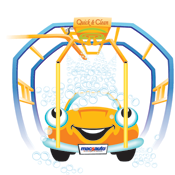 Sensormatic Car Wash machine is designed with the flexibility to wash various sizes of small, large cars until mini bus. The machine uses water high pressure and Creamy Shampoo. This combination guarantees to make cars look spotless and shiny. Sensormatic Car Wash machine moves automatically by pressing the buttons which are located on the electrical box. It uses Programmable Logic Controller (PLC), computer system for Industry and Inverter for speed controller. 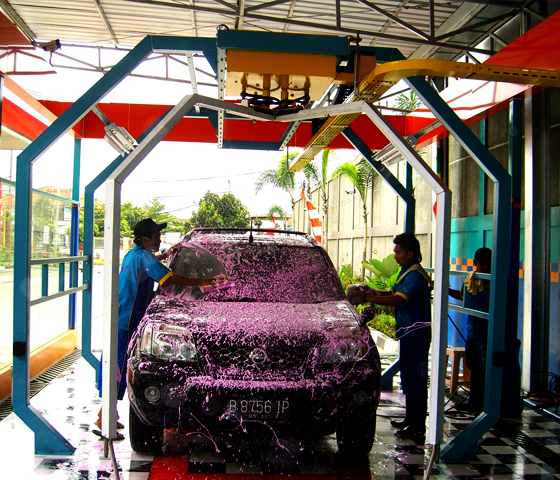 Sensormatic Car Wash machine is also equipped with INFRARED sensor which can measure the length of the cars. Therefore, allows Spray Arm to stop in a shorter position and delivers a perfect result on washing small size cars. Average time for washing each car is approximately 5 minutes.